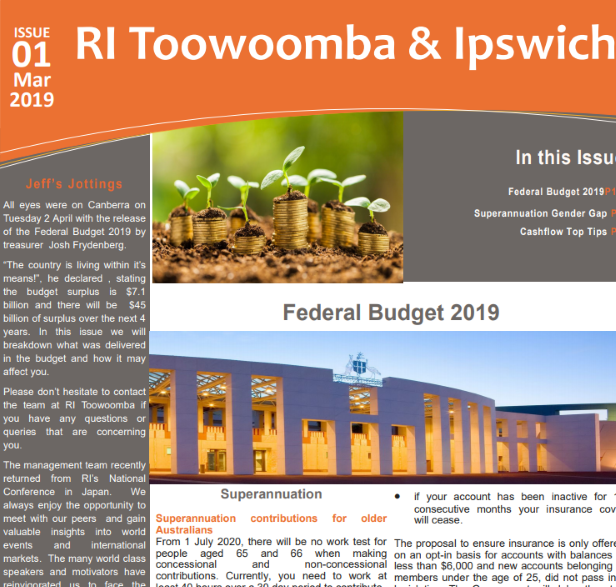 Read the latest edition of the RI Toowoomba & Ipswich Newsletter, Issue 1 March 2019 covering these main topics: Market Volatility: Federal Budget, Superannuation Gender Gap, Cashflow Top Tips. 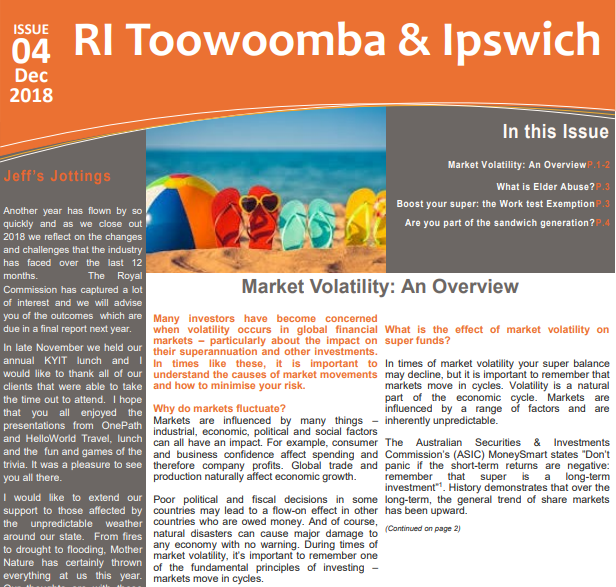 Read the latest edition of the RI Toowoomba & Ipswich Newsletter, Issue 4 December 2018 covering these main topics: Market Volatility: An Overview, What is Elder Abuse?, Boost your super: the Work test Exemption and Are you part of the sandwich generation?. Read the latest edition of the RI Toowoomba & Ipswich Newsletter, Issue 3 September 2018 covering these main topics: Market Insights, 30 Years of the $2 Coin, Save for Your First Home Through Super, Do You Have Too Much Insurance Cover, Saving for Retirement: Hacks for Parents With Dependants and Support in Aged Care. Read the latest edition of the RI Toowoomba & Ipswich Newsletter, Issue 2 June 2018 covering these main topics: - Federal Budget 2018-2019, Are you Retirement Ready, Simple Lifestyle Changes and How to cope financially with illness. Read the latest edition of the RI Toowoomba & Ipswich Newsletter, Issue 4 December 2017 covering these main topics: - Economic Overview - How to reduce your retirement worries - Reducing stress to cut your heart attack risk - Longevity: Are you prepared? Welcome to the September edition of our RI Toowoomba and Ipswich Quarterly Newsletter. In this edition we cover: - Economic update - Are you insuring your biggest asset? - Do investment propertied really add up? - Six ways to take control of personal finances after divorce.